It all starts well, we’ve captured their attention…the message is gripping and as your presentation momentum grows, you’re self-praising yourself in your head that you’re doing spectacularly well. But then…you freeze, you forget your words…you start mumbling and your blood pressure starts to rise. OUCH…you feel like you’ve completely bottled it! 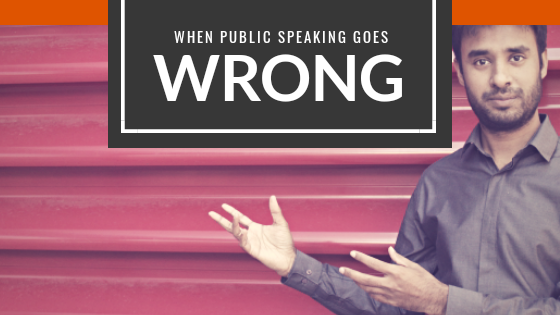 Trust me, no matter how much you practice even the most experienced of professional speakers can really mess up on stage. And I’ve been there myself. A great thing I’ve learnt over the years is to approach mistakes and errors on stage a part of your act, embedded with humour. We don’t totally forget what we prepared to say, but have temporary moments of brain freeze or lapse in concentration. The technique is to learn to practice embarrassing yourself. As weird as it sounds, the more you do random things that people don’t expect or might laugh at, the more your build on comedy and humour. But most importantly you remain humble about it until you get yourself back on track. Swaying slightly off topic because you’ve forgotten a few lines or the key gist of the topic doesn’t mean you’ve totally messed up…just make sure you embed a story that is relevant and adds enough value to bring you back on track. Most audiences won’t pick up on mistakes you make, only you will. So, continue as if it’s part of your presentation. I’ve had one incident when I was sharing 7 key principals of growth and development…however at the time of presentation I could only deliver 6. The 7th principal was just not hitting my brain and I did feel awkward, however if I continued trying to figure out the 7th, I would break the rhythm of the speech and fall into panic mode. Instead I decided to carry on the presentation until the 7th principle hit me before the end of the presentation, allowing me to reveal it as a key closing message of my speech. The idea is to learn to twist things on its head and make the audience believe its part and parcel of your performance and speech. If you develop the ability to improvise, then the core message will always remain and the rest will be a matter of how confident you are and how engaged you can keep your audience. The Speakers Dilemma: How Much to Charge as a Speaker’s Fee?